If we regularly follow the ups and downs of our sports team, we’ll invariably figure out which players have character and who doesn’t. And in the automotive world, very few cars have as much character as the Subaru WRX—especially if it wears an STI badge. It’s a powerful car, with a turbocharged 2.5-litre four-cylinder engine that produces 310 horsepower—up by five for 2019—and 290 pound-feet of torque. Its all-wheel drivetrain can be manually configured to send more torque to the front axle or the rear one, according to the driver’s preference. 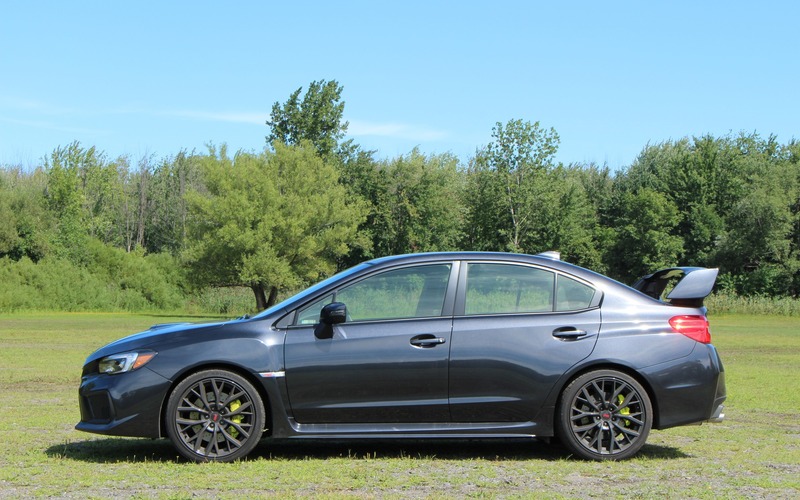 No slushbox here, as the only transmission available in the STI is a close-ratio, six-speed manual. The WRX STI is noisy, whether it’s idling or accelerating at wide-open throttle, while vibration and harshness is part of the driving experience. All the time. It takes off with a violence that triggers goosebumps, and sticks to the pavement in curves with exceptional force. Behind the wheel of the STI, it’s impossible to drive like a senior citizen. Its dynamic abilities are downright impressive, and like a hockey that shows character, the car always gives its 110% during each drive. While we appreciate that quality in a professional sports player, because victory is the only thing that counts, it’s very different in a road car. On the everyday commute, the 2019 Subaru WRX STI is exhausting. It rattles its occupants on all types of road surfaces except newly paved highways—a rare sight in Canada—and the exhaust drone is omnipresent. As for fuel economy, we averaged 12.0 L/100 km during our test. The engine requires super unleaded by the way. The seats offer great lateral support in addition to being quite stylish, with a mix of leather and faux-suede upholstery as well as red accenting. We also like the red seat belts. The dashboard is functional and most controls are within easy reach, while the infotainment system is modern. However, some of the latter’s on-screen buttons are too small, and since the car settles down, they’re hard to tap on while we’re driving. And then there’s the car’s styling. Younger folks probably like it, but it’s the older car buyers that can afford the insurance premiums. That rear wing is a love-it-or-hate-it addition, but luckily, it can be swapped for a more subtle trunklid spoiler on the Sport-tech trim. Oh, and the STI is the last model in Subaru’s lineup that can’t be equipped with its EyeSight suite of advanced driving aids. Not that typical STI buyers would necessarily want it, though. The STI is all about character. But like a good hockey player, it costs quite a lump of dough with an MSRP from $40,195 before freight and delivery charges. 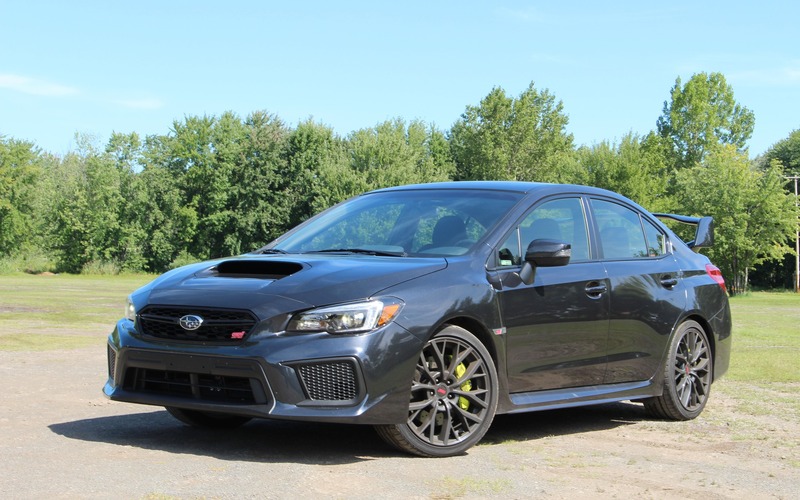 The “regular” 268-horsepower WRX is almost as fast, consumes less fuel and its engine seems to be more reliable, and costs almost $10,000 less. Also, a finesse player like the Volkswagen Golf R, despite not having as much character, scores as many goals as the STI without always ending up in the penalty box. 6/10	The engine could soak up a little less fuel under more relaxed driving, but behind the wheel of an STI, that’s unthinkable. 6/10	The front seats offer great support during spirited driving. Otherwise, the car is too noisy and constantly rattles its occupants. 8/10	An explosion of torque at low engine revs. The 2.5-litre engine is a force of nature. 7/10	An easy-to-use interface, but the sound quality is average at best and some on-screen buttons are too small. 10/10	The STI is a blast to drive hard on country roads. However, during the daily commute to work and back, it’s an exhausting car. 7/10	A car with this much character is now a rarity these days. The next generation of the WRX could very well be more refined. Don’t say we didn’t warn you.